Do you design composite floors in your structures for their fast construction speed, high performance and cost savings? Design composite floors with an efficient 3D design tool that is not only compliant to EN 1994-1-1 but also scalable for advanced numerical simulations (2nd order analysis, eigenvalue stability and modal analysis, etc). The analysis and design framework accommodates (besides the isostatic beam case) cantilever and continuous beams. The composite module is simple, yet flexible: irregular geometries, special loading scenarios and preferences in design approach are easily taken into account. The solutions offered for the floors are economical, yet safe, as these fulfil all design code requirements in both construction and final stages, ultimate and serviceability limit states and detailing conditions. You can summarise the design outcome on a plan view by using labels; each beam can have a label (e.g., UB356/127/33  c=15 mm) which contains the most relevant information for third parties (draughtsmen, contractors, collaborators). The same information can also be exported via the Revit link. fire resistance checks for composite beams in both construction and final stage. All these capabilities make composite design in SCIA Engineer a powerful tool for building designers. 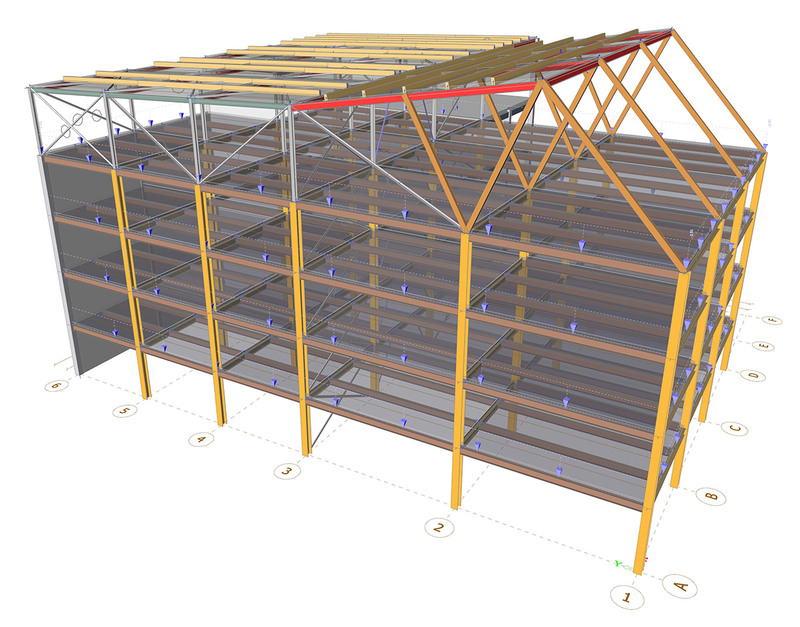 The EC4 composite module supports design for beams with a single web opening. The impact of the opening is taken into account in all checks in construction and final stages as well as in the beam AutoDesign. Web openings can be rectangular or circular, with any size and at any location along the beam. The design is performed based on the SCI P355 “Design of composite beams with large web openings” publication and is benchmarked to the examples provided there. It is planned to extend the support for web openings in the following version of: the plan is to soon support multiple and closely-spaced openings and reinforced openings.